Well, I got mom and four babies to vet this morning. Mom will be neutered and released. 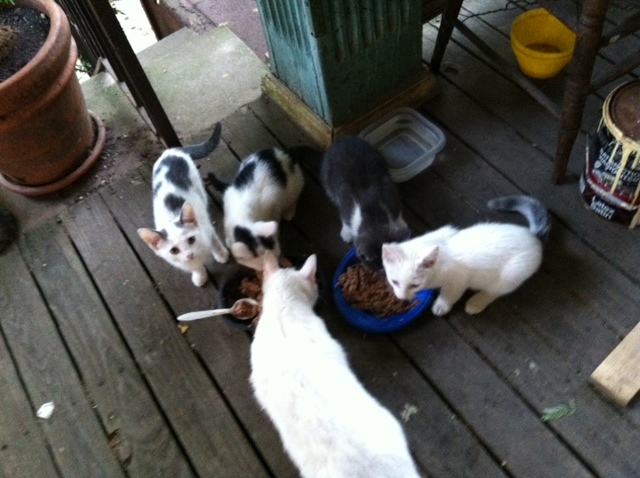 Babies will be checked and possibly neutered. If anyone can or knows of someone who can foster these until I find homes. I am desperate. I pick up everyone from vet on Wednesday afternoon. one grey with white feet and chest. Kittens will be at vet on Flatbush Avenue till Sunday afternoon due to the heatwave. They are neutered, have shots, tested and deflead. If you are interested in adopting or fostering one or some, please email Marie. Kittens are free. I have a similar problem with taxi garage cats. There are two breeding females (one with a new litter of six – born July 6) with at least a couple more females approaching breeding age. I went to a vet on 4th Ave who would do me a “favor,” since the cats aren’t really “mine,” and only charge $125 to neuter a cat, plus a $50 exam fee and $25 for required shots. That’s $200 per cat. I’ve already taken home a male kitten that had a foot crushed and will never walk normally again (much like its still breeding grandmother). I’m wondering what vet Marie is using that this multi-cat neutering is possible. My mistake. The vet I went to is on Atlantic Ave. Not 4th Ave. I will find out and email you. The vet gives Marie a steep discount because he is trying to help out too. She has rescued countless cats over the years and bringing them to him. Possibly this is the best solution for very low-cost neutering of stray or feral cats. List of orgs- such as ASPCA and Toby Project– and vets in NYC and what they offer. Thanks for the info. Looks like I’ll have to take a course to become TNR (Trap-Neuter-Return) qualified. Fortunately there seems to be an online course. I guess that’s the option to go with.